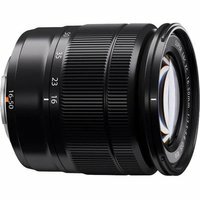 The Fujifilm XC 16-50mm f3.5-f5.6 OIS MK II boasts 12 all-glass elements in 10 groups, including 3 aspherical elements and 1 ED element. With its versatile zoom range of 16-50mm and 7 rounded aperture diaphragm blades, this lens is a brilliant all-round lens thats suitable for a wide range of photographic applications. Its image stabilisation function reduces camera shake in both video and stills.